ENGLISH BIBLIOGRAPHY OF THE NŌ. EPOCHS OF CHINESE AND JAPANESE ART. By Ernest F. Fenollosa. In two Vols. Crown 4to. Illustrated. 36s. net. A HISTORY OF JAPANESE COLOUR-PRINTS. By W. von Seidlitz. Illustrated in Colour and Black and White. One Vol. Crown 4to. 25s. net. JAPANESE PLAYS AND PLAYFELLOWS. By Osman Edwards. With twelve Coloured Plates by Japanese Artists. One Vol. Demy 8vo. 10s. net. KAKEMONA: Japanese Sketches. By A. Herbage Edwards. One Vol. Crown 8vo. 7s. 6d. net. A HISTORY OF JAPANESE LITERATURE. By W. G. Aston. One Vol. Large Crown 8vo. 6s. IN JAPAN: Pilgrimages to the Shrines of Art. By Gaston Migeon, translated by Florence Simmonds. One Vol. Crown 8vo. Illustrated. 6s. net. THE JAPANESE DANCE. By M. A. Hincks. One Vol. Crown 8vo. Illustrated. 2s. 6d. net. This plate, taken from a Japanese coloured woodcut, illustrates well the voluminous nature of the mediæval ceremonial garments. The figure is that of an ancient warrior of the Taira clan, to which Kagekiyo belonged (see p. 53), who was noted also for the high quality of his poetry. He composed a special verse, which he fastened in an arrow that he always carried in his quiver, and that proved to be the means of identification when he was found by his enemies, dead in the field of battle. In the illustration one may particularly note the mask, with the eyebrows painted so high on the forehead that they are above the fillet band. The feet are not bare, but are covered with the white tabi, or cotton boots with soft soles and a separate division for the big toe, in which the Nō dancers always perform their parts. The utai does not appeal to the uneducated, and for that reason its devotees have practically been confined to the gentle and aristocratic classes. In the days before the educational system of Japan was established on Western lines, boys of the Samurai class in many parts of the country were taught to chant the utai in their schools as a part of their curriculum, the object being to ennoble their character by imbuing them with the spirit of the olden times, and also to provide for them a healthy means of recreation in their manhood. Along with many other institutions, it declined in favour in consequence of the great social and political upheaval which ushered in the era of Meiji; and for some time afterwards the people were too much occupied with various material aspects of life to find any leisure for the cultivation of the art, so much so that its professional exponents, meeting with no public support, had to give up the forlorn attempt to continue their task and to look elsewhere for a means of earning their livelihood. With the consolidation of the new régime many old things took a new lease of life, the utai being one of them. Not only has the utai revived, but those who ought to know say that never in the long history of its existence has it been so extensively patronised as it is to-day. Patrons of the art are by no means confined to the aristocratic classes, albeit it is not so popular as[vi] the ordinary theatrical play, and never could be from the nature of the thing. This book will, therefore, well repay study on the part of any one desirous of knowing and appreciating the working of the Japanese mind, and the author and her colleague are rendering a good service to the public of the West by initiating them into the subject. As the author frankly admits, to translate the utai into a European language is a most difficult task, and, in my opinion, it is a well-nigh impossible one. The meaning of the original may be conveyed—its spirit to a certain extent—but never the peculiarities of the original language, on which the beauty of the utai mainly rests. It was very brave of Dr. Marie Stopes and Prof. Sakurai to undertake what I should deem an impossible task, and I am glad to be able to extend to them my sincere congratulations on their remarkable achievement. They have succeeded in their work to the best extent any one can hope to succeed, and in my opinion have placed Western students of Japanese art and literature under a debt of gratitude to them. Their poetry is the expressed essence of the Japanese. It represents them as the Victory of Samothrace represents the people of Greece, as the scent represents the rose. Chamberlain says, “The one original product of the Japanese mind is the native poetry”—their painting, their porcelain, their ceremonials, are modifications of Chinese classics, but their poetry is their very own. Among the greatest and most characteristic treasures of the native literature, the Japanese rank their ancient “lyric dramas,” the Nō. As Synge and the Irish poets speak for the Irish people the things that matter most to them and that yet go all unexpressed in their outward life, in the same sense, only to a greater extent, do the Nō dramas represent the old spirit of Japan. In Japanese the texts of the Nō dramas, all of which were written before the sixteenth century, are collected in a great work, the Yokyoku Tsukai, in which various editions give as many as two hundred and thirty-five to two hundred and sixty-two utai, as the librettos of the Nō are called. Yet these treasures are practically unknown to the reading public of the West, notwithstanding the interest that has been taken in “things Japanese.” Scholars certainly have paid them some attention, and a few utai have been rendered into English, but in most cases these translations are such as appeal primarily to scholars, and do not reach the wider public. Chamberlain’s Classical Poetry of the Japanese, in which some of the utai find a place, is perhaps the only exception to the general statement that no rendering of any of these plays has yet been made which is calculated to win those readers who do not delve in the Transactions of learned societies nor read transliterated texts in weighty volumes, but who, nevertheless, delight in the great literatures of the world. One of the reasons for this is certainly the extreme remoteness of the subject from everything to which we are accustomed, and the difficulty of translating into our own the obscure language of these mediæval texts. All students of Japanese are agreed about the excessive difficulty of making any rendering from the utai which combines fidelity to the original with lucidity in a European language. Yet these old plays are unique, exquisite, individual, and so full of charm that it is a great loss to the Western world that they should be entirely removed from our ken by being hedged in and shut away from us by the difficulties of language. It is clearly some one’s duty to translate, not merely the words of these plays, but their meaning and spirit, so that the Western public may have partial access at least to the source that delights, and has delighted for centuries, the best minds of our Allies in the East. No translation can ever convey more than a fraction of the power, beauty, and individual characteristics of the original, but it is my hope that there may be found between these covers something of the delicacy and charm of the Nō, some hint of their peculiar flavour and effect. If this consummation is in any single case achieved by this book, it will be, I fancy, only after the whole of it has been read and laid down; when a faint spirit of the Nō may take shape in the reader’s mind. Mountains blue in the distance before which we stand enthralled are composed of grey rough stone and broken screes when viewed at nearer quarters—yet we enjoy not less the illusory blue. The words of a stirring poem that wafts us into a fairy land of dreams are each one commonplace enough, and each can be reduced to its elements, a, b, c, d, e,—twenty-six of them, which can be ranged in a straight line. And so it is with the Nō. They must not be too much analysed and inquired into. Their language is simple, almost to baldness in places, it is true, but their simple elements create a wonderland of illusion. In Japanese they have the power to make the spirit soar into the borders of the enchanted regions of romance; and when acted the plays make one ache with Weltschmerz in a way that shows that their place is among the great things of our world, elemental in their simplicity. Then it must not be forgotten that the text of the drama as presented is accompanied by music, and is chanted by highly trained actors in a beautiful setting. Who would think of judging Wagner from the texts of his librettos alone, and of ignoring his power as a scene creator and a musician? The texts of the Nō are largely prosy, if you will. Mr. Sansom recently censured me, and with me the leading Japanese authorities on the subject, for our appreciation of the poetry of the Nō. He would have us believe that the steady popularity of these plays for six hundred years among the leading men of the country, from priests and poets to princes and warriors, is due to over-estimation, and that they are, after all, mostly prose of no high quality. In a language so widely diverging from our own in its construction and mode of thought as Japanese, the details of the literary style and composition are beyond reach of my judgment. As the Japanese for so long have been consistent in their admiration of the literary construction of the Nō, I am content in that matter to accept their verdict. But of the atmosphere and general effect of the plays I can judge for myself, and I find them among the supremely great things in world-literature. That Mr. Sansom does not, depends on his own taste in the matter. I have, in these modern days of unshackled opinion, heard people openly announce that they saw nothing in Shakespeare! I fancy that if we could translate literally into the English language the song of the nightingale to its mate, it would be found to be largely composed of mundane affairs and prosy gossip about its neighbours, the weather and the marauding school-boy. But is it to us any the less romantic and glorious in association? There is a focal distance for every work of art, and if we choose to overstep it and go and rub our noses against the canvas of supreme genius, we will only find smeary paint and an unpleasant odour. So, acknowledging the prosy elements in the texts of the Nō I have attempted to render, I present them in the hope that there will be some readers who will see through the shrouding veils of a foreign language something of the features of the eternal loveliness of the original. My great regret is the imperfections of my handling of these delicate fantasies. But with the exceptional knowledge and gifts of my collaborator in the translations, Prof. Sakurai, the standard of detailed accuracy has been kept up to a point which will, I trust, make these translations not entirely unworthy of a scholar’s perusal (but see p. 32); nevertheless, the reader whom my heart desires is not one to take too close an inspection of each detail, but one who will catch the spirit of the whole. None of the four plays that follow have been translated by any one else, so far as I can discover; so that, as they break new ground for it, the public will perhaps be lenient and sympathetic towards these efforts. In Japan to-day there still lingers much of the old aristocratic scorn of the common theatre, but the theatres which are dedicated to the performance of the Nō have no such stigma attached to them. Indeed, these performances are almost entirely supported by the gentle and aristocratic classes. The interest of intellectual men in these plays is not even satisfied with on-looking, and many of the leading men of the day in Tokio—lawyers, university professors, statesmen and aristocrats—study the chants and songs and give private recitals of them. A few even undertake the arduous training necessary to act a complete part, including the “dancing,” and then the gentlemen are proud to appear with distinguished professionals. The only comparable enthusiasm in our country is that of the Shakespeare societies; but even to act, and act well, a part in a Shakespeare play requires an amount of application trivial in comparison with that necessary completely to master a rôle in one of the Nō. For in “singing” the utai not only is every minute inflection of the voice prescribed and regulated according to the severest rules, but every movement of the body, every step and movement even of the toes or little fingers in the “dance” that accompanies it, is most strictly governed by an iron tradition, and the secret of some of the parts is only in the hands of a few masters. The charm of the Nō is a cumulative one, and its power of conveying much meaning in simple action is largely augmented by the suggestiveness of the interwoven allusions to the classical poems partly quoted or suggested in the words of the texts. Almost every word carries more than its face value, and has been enriched by centuries of usage in innumerable poetical and traditional connections. The Nō, as they are now preserved, date principally from the fourteenth and early fifteenth centuries, and all of them are prior to the sixteenth century. Their development took place under the Ashikaga Shogunate, particularly in the reign of the Shogun Yoshimitsu (1368-1394), when they soon became exceedingly successful among the nobles. They are to a large extent compounded from much older elements which existed in a more incoherent form prior to the fourteenth century; but they may be described as crystallising and taking their distinctive form under the hands of Kiyotsugu, who lived from 1355 to 1406. It is of great interest to note how closely the dates of our own Chaucer (1340-1400) correspond with those of the great Japanese master. What world-phase brought two such men to the front at the same time in the two island empires, all unknown to each other? Kiyotsugu was the founder of the Nō proper, and one of his pieces is given on p. 39. It is certain that he did not suddenly evolve this type of drama, but took the elements that were to hand and fused them together with the flux of his personal genius. Chief among the material available were the Kagura or pantomime dances which were performed at Shinto festivals on temporary wooden platforms. Direct descendants of these, nearly in their original form, have lingered on till the present day. I have seen performances on the rough temporary platforms, where the actors were gaudily but cheaply decked and where the crowded audience was almost entirely composed of the common people who stood semi-scornful for a few moments, or were detained for a long time while passing on their daily business. The antiquity of such performances can be imagined from the fact that in the Kojiki, which was written in 712 A.D., they were described as being ancient and their origin was associated with the sun goddess. The mythical story of their origin is one of the well-known tales of Japan. The sun goddess, Amaterasu, was offended and retired to a cave, withdrawing her luminous beauty from the world. As may be imagined, this was very inconvenient for every one, including the rest of the gods, who in their distress assembled on the dry bed of the River of Heaven. (This is the Milky Way, and to one who knows the mountain rivers of Japan it gives a very telling little touch, for the dry bed of a Japanese river is a broad curve of round white stones.) They endeavoured in many ways to lure the sun goddess out of her cave, and at last they invented a dance and performed it on the top of an inverted empty tub, which echoed when the dancer stamped. This excited her curiosity, and the goddess was successfully drawn out of her hiding-place, the light of her radiance once more blessed the earth, and all was right again with gods and men. The stamping on the hollow tub is still suggested in the “dancing” of the Nō, where the actor raises his foot and stamps once or twice with force enough to make the specially prepared wooden floor of the stage echo with a characteristic sound. It is quite probable that the actual words of the utai (librettos) of the Nō were partly, if not entirely, written by Buddhist monks, and Kiyotsugu was only responsible for bringing the whole together and stage managing and stereotyping the plays. Following Kiyotsugu, who died in 1406, was his son Motokiyo (one of whose plays will be found on p. 56), who lived from 1373-1455. As well as adding to the number of the actual plays (as many as ninety-three are attributed to him) he greatly improved the music. By the time of his nephew some of the several different schools of Nō interpreters, which are still in existence, had sprung up. The ruling Shoguns paid great attention to the Nō. Kiyotsugu the founder was taken by the Shogun into his immediate service and was even given the rank of a small daimio. Both Hideoshi and Iyeyasu, two of the greatest men in Japanese history, were not only fond of witnessing the plays, but it is reported that they actually took part in them among the actors. A single Nō play is not a lengthy performance, the average time for its complete presentation being merely one hour. But a performance of Nō at a theatre generally lasts a whole day (except at special short performances, mostly arranged in connection with festivities), because half-a-dozen pieces are on the programme, and between each is given one of the “mad-words,” or Hiogen, which are short, ludicrous farces, and which serve to relieve the tension of the higher, and generally tragic pieces. The theatres, which are specially built for the Nō performances, are smaller than the common theatres. The stage is a square platform, generally measuring about eighteen feet, which stands towards the middle, so that the audience sit on three sides of it. This stage has its own beautifully curved roof, which is separated from the roof over the audience by a slight gap, and is reminiscent of the time when the Nō were performed on the outdoor wooden platforms while the audience stood round in rain or shine. On the stage itself are two pillars of smooth wood, which support its roof (see diagram facing p. 10). The stage is horizontal and is raised a few feet above the ground; it is made of very smooth and peculiarly resonant boarding, which is of special importance in the “dancing,” in the course of which the actor has to stamp at intervals with his shoeless feet and yet to make a loud, though deadened sound. Let us not forget the inverted tub and the sun goddess. This feature of the dancing is not to be despised, for its effectiveness is notable. By the kindness of the Secretary of the Royal Society of Literature I am allowed to reproduce my plan of the Nō stage from their Transactions, so I am tempted to quote also a paragraph describing it. “Leading to the stage is a gallery nine feet wide, along which the actors pass very slowly on their way from the green-room to the stage, and pause at each of the three pine trees stationed along it. A curtain shuts the end of the gallery from the green-room. All the woodwork is unpainted and unstained, though very highly polished, and there is neither scenery nor appliances to break the harmony. The three actual pine trees and a flat painted pine on the wall at the back of the stage are all the ornament there is.” The wood-cut facing p. 10 is an illustration of this stage taken from a Japanese print. It represents an “undress” recital, but shows well the build of the stage itself. The pine tree which is painted on the bare boards at the back is not realistic, but is much conventionalised, with solid emerald green masses of foliage and a twisted trunk. It is like those trees which are seen in symbolic pictures and on ancient ceremonial embroideries such as are used at weddings and at the New Year time. The pine tree, and all it has come to mean to the Japanese as a symbol, is closely associated with the Nō. Deeply interwoven in the national sentiment is the play Takasago, which is the story of the faithful spirits of the pine tree and is perhaps the most important and most beloved of all the Nō. To the left is the gallery along which the actors enter. On the stage is a figure in ordinary ceremonial dress, not in costume, reciting a piece with the aid only of a fan. Note the beautifully elaborate roof belonging to the stage itself. The pieces of blue sky in the right and centre which break into it, like the clouds in the left foreground, are a conceit of the artist, but the blue sky to the left indicates with verisimilitude the open space surrounding the stage. 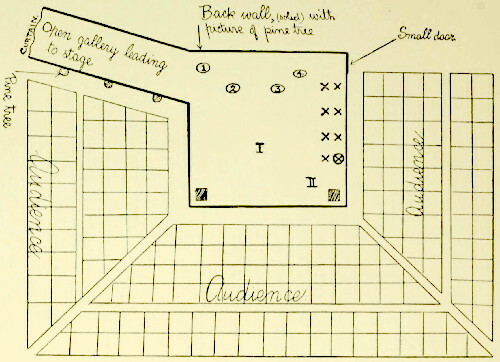 Diagram of stage arrangement in the Nō, showing also the position of the audience. On the stage the chorus is represented by crosses, the leader of the chorus marked . The numbers I and II represent the positions during most of the action of the leading actors. The encircled numbers show the positions of the musicians, who are stationary during the piece. The squares at the front of the stage represent the two pillars supporting its roof. Reproduced by permission of the Royal Society of Literature. Quoting again from my paper: “Before the play begins the chorus comes in, robed in blue or blue-grey, and enters into the colour scheme. The men squat on their heels with their legs folded straight and flat along the boards on the right of the stage, and before them lie their fans, which remain closed through the whole play, but are raised upright while they are singing. The chorus chants at intervals throughout the piece, sometimes informing the audience of the events supposed to be taking place, or to have taken place, sometimes moralising on the fate or feelings of the hero or heroine, sometimes describing their emotions, sometimes even instructing them. While they are doing this their fans are raised upright, with one end touching the ground, and are laid down again directly the words are finished. The Japanese name for the chorus is ji, a word meaning also ‘ground’—the ground colour, as it were, on which the figures of the drama are painted.” As is natural, such an arrangement of chorus and stage recalls the Greek plays. The comparisons and contrasts between this and the Greek, which spring immediately to one’s mind, have already been published by Prof. Chamberlain and others, who have given some account of the Nō, and to whose works reference should be made (see list on p. 103). The music is an important feature of the Nō plays, when they are completely presented. Indeed, the whole play can be more fairly compared with opera than with anything else on our stage, though the “singing” is very different from ours. The songs are given with a curious voice in which suppressed breathing is an item of value. Other parts of the play are chanted in unison, and even the prose “words” are intoned in a unique way which removes them absolutely from the realm of ordinary speaking, and makes them—to a foreigner—practically indistinguishable from the songs. There are, in addition to this vocal music, four instruments, and the players of these are distinct from the chorus and do not enter into its chanting at all, except sometimes with a sudden sharp Ha! or something which I confess I can only describe as being like the howl of a cat, and which did not seem to me to add to the impressiveness of the music, but to detract from it. The musicians enter the theatre and take their place on the stage, in the places indicated in the diagram, after the chorus is seated and before the actors appear. In a full set of musicians the first is the performer on the taiko, who plays a flat drum set in a wooden stand on the floor, ornamented with a gorgeous scarlet silk tassel of such size and brilliance as to lend a vivid beauty to the quiet colour scheme. The next musician is the player of the ōtsuzumi, which is a kind of elongated drum held on his knee. The kotsuzumi is an hour-glass-shaped drum, which is held on the shoulder. Both Profs. Chamberlain and Dickins call this a tambourine, but that name gives an entirely wrong impression both of the shape and the sound of this instrument. The last musician plays the fue or flute. Most Westerners are content to call this music “a discord.” It is therefore pleasant to find Mr. Sansom saying, “At times the flute strikes in with a long-drawn note that has a strange and moving quality of sadness.” Personally, with the exception of the single interjected cries, the music appealed to me as being in complete harmony with the pieces and as adding greatly to their charm and meaning. The actors enter from behind the curtain at the end of the gallery leading to the stage. They move towards the stage one by one, and very slowly, with long intervals between each step, every motion of which has been decreed for centuries. Captain Brinkley says, “It is, indeed, more than doubtful whether any other people ever developed such an expressive vocabulary of motion, such impressive eloquence of gesture. These masked dancers of the Nō, deprived of the important assistance of facial expression, and limited to a narrow range of cadence, nevertheless succeeded in investing their performance with a character of noble dignity and profound intensity of sentiment.” The actors pause at each of the pine trees which stand by the gallery to mark a stage in their progress. Only men act, and for the women’s parts they wear the conventional masks with the white, narrow face and the eyebrows painted high up on the middle of the forehead, which is the classical standard of female beauty. Masks are also worn by those representing demons or ghosts, and these masks are much on the same plan as those worn by children on the fifth of November. They are made of carved wood with a slit for the mouth and two holes for the eyes. They are palpably masks put over the face and make no pretence at verisimilitude; indeed, sometimes the girl’s mask may be openly tied on with a fillet ribbon across the forehead. They are clearly illustrated in the plates facing pages 15 and 76, where the white mask-face is put so as to show quite frankly the tanned and corrugated neck of the elderly actor. 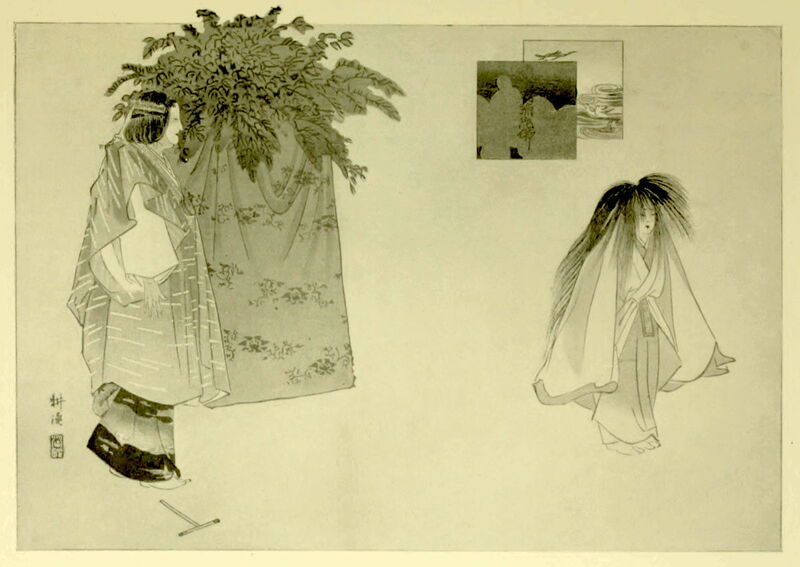 Wild bushy heads of long hair are also worn by those taking the part of demons, and sometimes by the ghosts, as is seen in the plate facing p. 76, where the little figure represents the ghost in the Sumidagawa. The figure of a country girl, who was also a poetess, and sent a subtle verse in reply to a noble who sought to obtain some of the plant growing by her cottage (as represented on the stage by the bower to the left of the cut.) The figure shows well the ceremonial dress, of scarlet hakama, or divided skirt, with flowing, voluminous kimono over it. At the throat can be seen the series of under-dresses, of which only the edge of each appears. 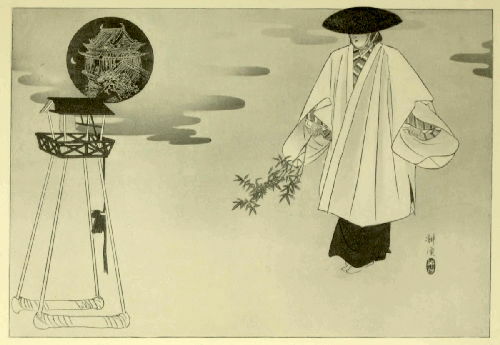 The massive folds over the head are not some head-dress, as might at first be thought, but the folds of the long kimono sleeve falling back over the arm which is raised above the head. The squatting figure to the right is that of a priest, who comes into the story of this Nō. Though in other respects the Nō staging is so simply organised, the costumes of the actors are sumptuous and completely representative of the parts the actors are playing. The various robes are all of mediæval cut and fashion, and are mostly very stiff with opulent brocades or embroideries. Some of the styles are shown in the various illustrations in this book, and it will at once be noticed that they are all elaborate and richly coloured. While the cut of most of the garments is something akin to the simple kimono and hakama (divided skirt worn by the men when fully dressed) of the present day, they are on a more massive scale with great stiff boufflé divided skirts (as the figure in plate 3, p. 14, shows particularly well), and with the kimono sleeves so wide and stiff that the wearer seems almost three times his normal width. The figure on the Frontispiece illustrates such excessively voluminous and elaborate dress. The garments may be worn in overlaid series, showing beneath a rich overdress the edges of many equally fine under-robes, and of course armour and accoutrements are carried by those representing the ancient warriors. The costumes of the Nō are in truth the treasures of a museum, put to actual use. There are few or no “stage properties” of any kind. Just as there is no scenery and the images of the places in which the action lies must be evolved in their own minds by the spectators, guided by the descriptive passages of the play; so also there are no appliances. If the actors, for instance, have to enter a boat and be rowed across a stream, they will perhaps merely step over a bamboo pole. If one of the characters has to ladle up water and offer it to a fainting warrior, the whole action is accomplished with a fan. Sometimes there may be a little in the way of properties—for example, the arbour-like bowers in plate 3, p. 14, which are drawn on to the stage and represent dwellings, and in plate 4, p. 16, where the little temple bell is brought into the action. But even in such cases the actors have to create an illusion round the accessories by their words and motions. We scarcely need to be reminded that Shakespeare’s plays were originally written for a stage which had but little more in the way of properties, and that even to-day there are not a few persons who feel that Shakespeare’s finest passages do not gain but actually lose by the life-like and elaborate settings of the modern stage. 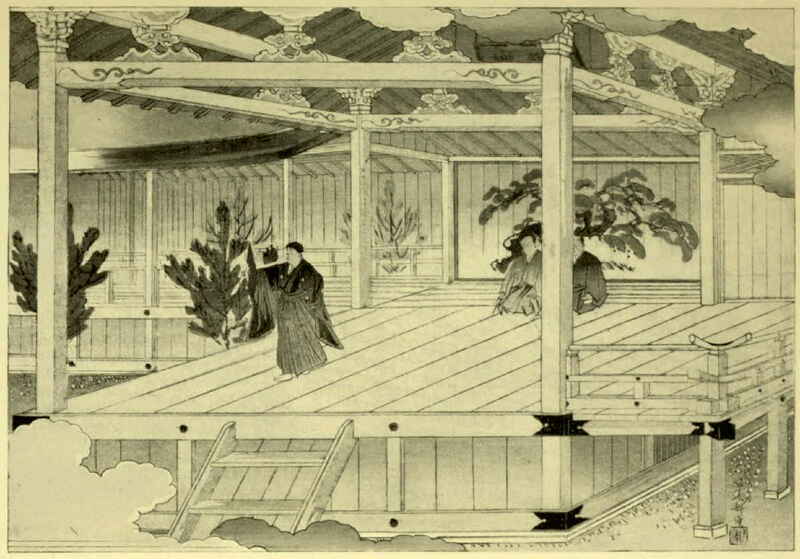 This print, taken from a Japanese coloured woodcut, illustrates the central figure of a Nō drama, with the single, most characteristic piece of stage “property,” belonging to the play. 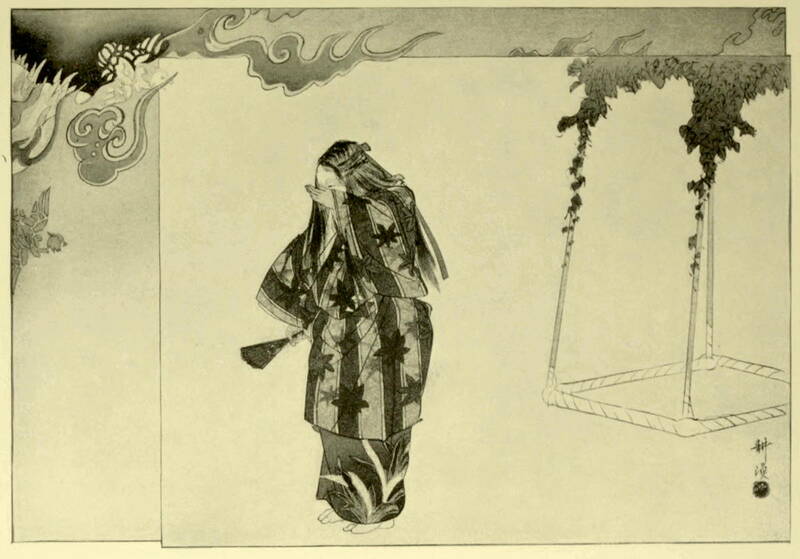 The figure is that of a mother, well-nigh mad with grief at the loss of her child, (note the bamboo in her hand, a symbol of her state) who sets out to seek him. She finds the little one at the Temple of Miidera, a view of which is inset in the black circle on the left of the print. The model of a temple bell in red lacquer beneath this is mounted on roller feet, and is an illustration of the piece of property which is all that represents the temple on the stage, and is a good example of the simplicity of the stage-mounting of the Nō pieces. Prof. Aston, in his History of Japanese Literature, says (p. 200): “Representations (of the Nō) are still given in Tokio, Kioto and other places, by the descendants or successors of the old managers who founded the art ... and are attended by small but select audiences composed almost entirely of ex-Daimios or military nobles and their ex-retainers. To the vulgar the Nō are completely unintelligible.” The contrast between the audiences at the Nō and at the common theatre is very marked, but then it must be remembered that practically no one of culture or refinement attends the common theatre, and practically every one of that class is interested in the Nō. Owing to the present social conditions in Japan, however, the audiences at the Nō pieces are not so small or so restricted as this would lead us to believe if we did not remember that ex-daimios and military nobles have entered almost every social grade; many, indeed most, of the common police are Samurai, excessively poor students of the University or school teachers, and even rickshaw-men may be the representatives of the proud old families. When, a little more than forty years ago, the great social upheaval and re-organisation of Japan took place, and the nobles and Samurai lost their privileged positions, though they were given positions of honourable standing so far as possible, many of them entered the ranks of what we would call the “common people”; and so it happens that to-day there are permeating nearly the whole of society, in all its grades, some of the old cultured class. Among policemen, rickshaw-men and gardeners one may come across men of deep classical interests and knowledge, and a poor student living on a few shillings a week may spend his evenings chanting the Nō songs to the moon. Indeed, while I was in Tokio such a one lived near the house in which I dwelt for a few months. I never met him personally, because I did not wish to destroy the wonderful impression of melancholy romance and weird beauty which his chanting gave me. The many evenings that I sat alone on my balcony, looking toward Fuji mountain, behind which the sun had set, and heard in the swiftly passing twilight and under the glittering oriental stars the mournful, tragic chants of the Nō which this young man was practising, have left their life-long impression on me, and perhaps account for the deeper love and understanding of the Nō which have come to me than to the foreigners who hear only a few performances in a theatre. Yet this young man lived in what could scarcely be called more than a hovel, and he is representative of thousands now so living in Japan. Consequently one must remember that though the audience of a Nō theatre is “select” in the real sense, it is not by any means entirely composed of wealthy folk. All who can afford to do so come in full ceremonial dress, which is sombre-coloured both for men and women, for custom only allows the brilliant colours to be donned by children and young girls. Most of the audience arrives by nine o’clock in the morning, and remains till three or four in the afternoon. The “boxes” are little matted compartments marked off on the floor, with railings round them but six inches high, and every one sits on his folded-up legs on a cushion on the floor. 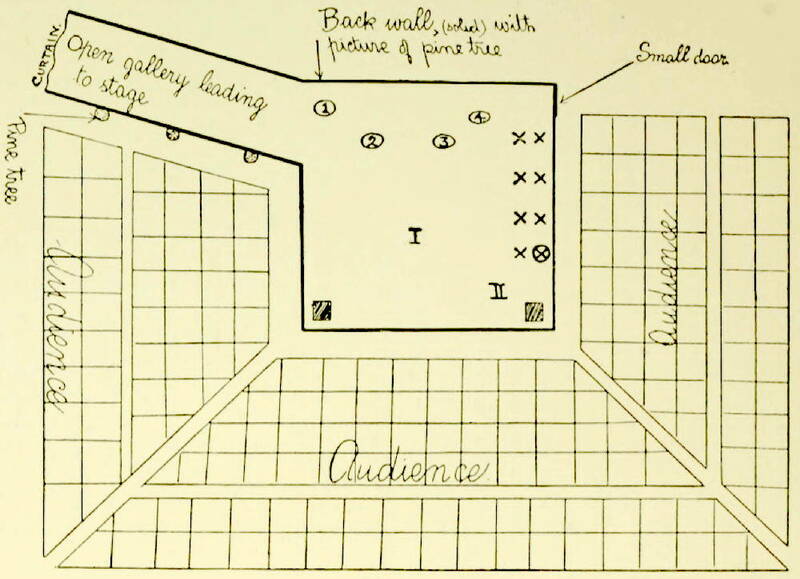 As will be seen in the diagram (p. 10) the audience sits round three sides of the stage. In the winter they will have a little charcoal fire in the box beside them, and will sit warming their hands over it as they watch the piece. In a common theatre the audience talks, eats, and even plays games between the scenes of the play, and gives its best attention during a murder or a very realistic hara-kiri, when the blood trickles in lifelike fashion out of the actor’s mouth as he writhes for half-an-hour in his death agonies with a crimson gash across his middle. I shall never forget a scene of the kind which nearly did for me altogether, but which stirred the whole audience to breathless attention. During a performance of the Nō, on the other hand, most of the audience listen absorbedly to the whole piece, many being well able to check or criticise the actor if he should make the slightest slip, as they are personally acquainted with the parts. Others follow the chanting with a book of the text in their hands, and thus secure themselves against losing a word; for the Nō is like our own opera in this, that unless one is well acquainted with the words of the piece they are apt to be lost here and there. Each one of the audience has some knowledge of classical poetry, and according to the degree of this knowledge is the enjoyment of the thousand allusions and part quotations and adaptations that are in the plays. With each recognised reference to some classic poem or story, the richer does the suggestion of the whole become, for a word or a phrase which has but little meaning in itself becomes fragrant and beautiful when it carries with it the perfume of a thousand lovely and suggestive memories. Also working upon the sensitive audience all the time, there is the psychic effect of the beautiful and harmonious colouring and of the potent music. The psychological effect of music is a power which we all vaguely recognise, but few of us begin to understand. Nevertheless, I hold it as certain that for the time being it physically as well as spiritually affects us, and that when we are tuned to the throb and rhythm of fundamentally great and right music, though we are no nearer to an intellectual understanding of the root things of the universe, yet we are actually nearer a spiritual oneness with, and hence a sort of comprehension of them. The music of the Nō, founded on a different scale from our own, has a very peculiar effect, yet one in complete harmony with the mental conceptions of the plays. And to this effect the audience of the Nō is pre-eminently exposed, for all the surrounding conditions are calculated to enhance and aid it: the magnetic effect of the quiet, intellectual audience on itself; the beautiful simplicity and harmony of the colour scheme within the theatre; the dignity and impersonalness of the actors fulfilling their anciently prescribed actions; the allusions and suggestions of the poems, the descriptions of natural beauties and the frequent references to religious and philosophical ideas; when combined with the strange and solemn music of the singers create together within the heart of the observer a something which is well nigh sublime. True “dramatic” qualities are almost entirely absent from the Nō; there is no interplay of the characters, no working up of a story to some moving, dramatic and apparently inevitable conclusion. Nor are the unities of time and place in the least regarded. Even centuries may be supposed to elapse in the course of the story of a play, and an actor may be represented as travelling far while declaiming a short speech. An outline scheme of the plot which would be found to fit the majority of the plays is as follows: The hero or heroine, or the secondary character, sets out upon a journey, generally in search of some person or to fulfil some duty or religious object, and on this journey passes some famous spot. In the course of long and generally wearying wanderings, a recital of which gives an opportunity for the descriptions of natural beauties, this living person meets some god, or the ghost or re-incarnated spirit of some person of note, or perhaps the altered and melancholy wreck of some one of former grand estate. Generally at first this ghost or spirit is not recognised, and the living hero converses with it about the legends or histories attached to the locality. Usually then toward the end the ghost makes itself known as the spirit of the departed hero for which the spot is famous. Often a priest forms one of the characters, and then the ghost may be soothed by his prayers and exhortations. There is generally some moral teaching interwoven with the story, the hero or the ghost exemplifying filial or paternal duty, patriotism, or some such quality; while there is a thread of Buddhistic teaching throughout. In this the main theme is the transitoriness of human life, and at the same time is presented a view of all the pain and misery people may endure when they are not rendered superior to it by a recognition of the higher philosophy that teaches that the whole universe is a dream, from whose toils the freed spirit can escape. The primitive complement of actors was probably two, but few plays have so small a number. Three or perhaps four actors is the usual, and six, with a few exceptions, is the highest number for a complete cast. 1. The hero or protagonist is called the shite. 2. The companion or assistant to the hero is the tsure. 3. The balance of the story is preserved by a sort of deuteragonist called the waki, who may also have his tsure. 4. A child part may be added to enrich or add pathos to the play (as in the Sumida River for example), and he is called the kokata. 5. Then there may be the ahi, or supplementary actor. The actors do not perform many evolutions on the stage, and though their movements are in harmony with the story to some extent, they tend to remain more or less in the relative positions that are indicated on the plan of the stage facing p. 10. The text of the Nō is composed of a mixture of somewhat stilted and archaic prose, incompletely phrased portions, and poetry in correct metrical form. The strictly compressed and regulated five and seven syllabled lines of the short, standard verses of Japan are here scattered somewhat irregularly. Indeed, the general text of the Nō may perhaps best be described as poetry but half dissolved in prose; or, to use another simile, as an archipelago of little islets of poetry in a sea of prose, each islet surrounded and connected by sandy shores and bars which have been reduced almost to sea level. All through the pieces there is an immense number of plays upon words, of “pillow” and “pivot” words, of short quotations from and allusions to classical poetry, so that the text simply bristles with opportunities for literary “commentators.” The excessive amount of classical allusion and quotation, while it does not appeal at all to us, is one of the features which principally delights the Japanese literati. For this is considered not only to show the degree of knowledge which the author possessed, but also to add greatly to the richness and suggestiveness of the piece by bringing to the memory other cognate scenes and ideas. The merit of the frequent quotations being that they allow of great compression and terseness of style, so that in a few words an author can bring a series of scenes before the mind of his audience. 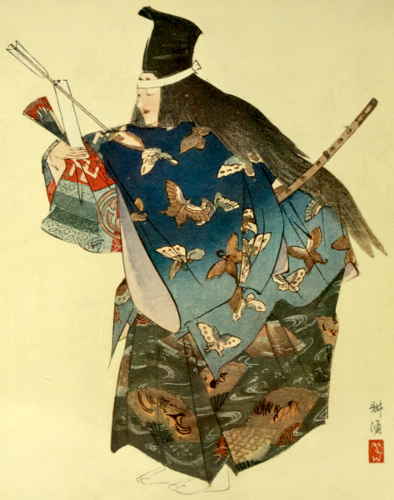 This plate, taken from a Japanese coloured woodcut, illustrates the Nō of which Komachi is the heroine. She was a poetess of great beauty and poetic gifts, and many distinguished poets were very jealous of her. On the occasion of one of the competitions of verse before the Emperor (the figure on the extreme right with scarlet skirts) one of her enemies attempted to prove that her verse was plagiarized and that he had it already in his own collection. She proves his fraud by washing out the verse which he had just written into his book after hearing it, showing that it was not printed with the rest. This she is about to do in the picture. The story continues that after his exposure he tried to commit suicide to escape disgrace, but she generously prevented him. The mask worn by the actor who takes her part well illustrates the classic type of beauty in Japan. The eyebrows are shaved off, and painted on high upon the forehead beneath the hair. In the action she uses a fan to express the business of washing out the interpolated verses (see p. 16). The oblong article to the right represents the table on which a copy of her verses was laid in the competition. As regards rhyme, there is no use of such rhyming as characterises our own verse; and this may partly depend on the structure of the Japanese language. Japanese words are not composed of letters as they are with us, but of syllables; every consonant is associated with all the vowels. Thus the words are compounded of a larger number of elements than with us, but each ends in one of the five vowels or in n. The elements are ka, ki, ko, ta, ti, tu, te, to, and so on. This will at once be evident if we examine a few words of romanised Japanese. For example, the first line of the play Tamura is Hina no myakoji hedate kite. In the utai, though there is no terminal rhyming, there is sometimes a tendency to repeat the same syllable more than once in a phrase, with the deliberate intention of accentuating it. Only half-a-dozen of the complete Nō and portions of a few others have been translated into English from all the many Japanese originals that are available. But this is scarcely surprising. In translating any of the Nō there are two supreme difficulties to be encountered. The first depends on the organic remoteness of the Japanese language from our own, which is common to any translation from the Japanese; and the second is the peculiar difficulty of translating the utai because the exact meaning of many portions of them is disputed even by Japanese authorities, and then even where the meaning may be clear to a Japanese expert the compression of the language is so great that it cannot literally be rendered into a European language. From a French or German, even from a Russian original, a literal translation is comprehensible even if it is not beautiful in English. A literal English translation from a Japanese original is arrant nonsense. The Japanese language is not merely unlike ours; the whole mode and order of the thought upon which it is founded is on an entirely different plan from our own. The more conscientious the translator the greater his difficulty. It is easy enough to translate “O yasumi nasai” as “good-night,” but how are we to say in English what it really means, i. e. approximately “honourably deign to take rest,” without appearing remote and stilted? And that is just a simple little common phrase; when the Japanese to be translated is contorted and coruscated with “pillow words” and “pivot words,” with a phrase from an old classical poem of which the reader is supposed to know the whole, and cannot “see the point” unless he does so, what is the translator to do? But suppose, further, that a couple of the words are the subject of learned controversy, as is frequently the case, is it likely two translations will coincide? There are three principal lines that a much-to-be-pitied translator may take. (1) He may give up in despair any attempt at being literal. He belongs, let us say, to the school that think it best to translate “O yasumi nasai” as “good-night.” He has this pre-eminent virtue that he will give us at least a version which can be read as English. And there is much to be said for this mode of treatment. (2) On the other hand, a great contrast to translator No. 1 is he who desires to give a literal version of the Japanese, and who does not care in the least whether it sounds smooth and finished in English. (3) Then there is the last, and perhaps the most misguided of all, who cares a great deal to convey the true Japanese impression and also tries to polish and round off the English so that it may not appear too stilted or too rough, but may convey to the English reader something of the true spirit of the Japanese without always diverting his attention to some peculiarity of the rendering’s bodily form. As I myself have endeavoured to supply the third type of translations, I may be allowed to enlarge a little on the attitude of mind of one making the attempt. M. Bergson, in his inimitable book on laughter, says, “Where lies the comic element in this sentence, taken from a funeral speech and quoted by a German philosopher: ‘He was virtuous, and plump’? It lies in the fact that our attention is suddenly recalled from the soul to the body.” The sudden intrusion of the body, particularly the imperfect or ill-managed body, is the source of most of the comic element in human life. Hence, recognising this fatal pitfall, I have felt it essential to make the body of my translations as little irritating and noticeable as possible, while at the same time preserving, as far as the language will allow, complete truthfulness to the spirit of the original. All my sympathies are with the translators in class No. 2, and were our universe not organised in the humorous way that M. Bergson has pointed out, I should have ranked myself with them, and attempted to give only a literal rendering of the Japanese. But such translations never allow us for a moment to forget the English body of the original Japanese spirit, because the body they give it is out of joint, abnormal in our eyes, and therefore it absorbs our attention or renders ridiculous the hints it conveys that the spirit it encloses may have aspired to soar. All the time we are reading this the magic of suggestion is working, and we would fain let our minds float away into the land of spring; but our attention is brought plumping down to the bodily presentation of the thoughts and our intellect is set at work to see how the lines might have been made to scan, or to run in some form of rhythm. So long as they do just scan and have a passable rhythm, we do not think of the poetical qualities of the translation, but when they jolt us along our attention is constantly diverted from the higher theme to the lesser subject of English grammar and versification. So that I have endeavoured in my translations to make the lines run smoothly enough to be read aloud without much irritation; and though I have doubtless not fully succeeded, I have tried to give them as much verbal beauty as was possible within the narrow limits afforded me by the literal Japanese meaning. In this my collaborator, Prof. Sakurai, has held the rein on me at times when I would have liked to run away with some poetical conceits, and it is owing entirely to his tireless exertions that the result has a fair degree of accuracy. I must relieve him of too great a responsibility, however, for I confess that here and there where it seemed to me imperative to put in a word or two more than was in the original in order to convey the necessary impression to an English reader, or where several lines of metre would have been upset if he wouldn’t let me have the word I wanted, I have just taken the bit between my teeth and run away from him. But this has happened seldom, and on the whole I think it will be found that the English version bears close comparison with the Japanese. Now a word regarding the type of verse that is used by those who translate into a recognisable English form. Of these the translations in Prof. Chamberlain’s Classical Poetry of the Japanese of four of the finest and most renowned utai of the Nō are models to be considered by any later translator. Prof. Chamberlain puts the “words” into prose, and the “songs” into rhymed verse. as none of the prose in the least corresponds to our prose, and as it is not given in the ordinary speaking voice of the Japanese, but is always specially intoned, it seems to me much more suitable and harmonious to render the whole utai in verse of various kinds. Even this little book has been the task of years, despite its many imperfections. It was undertaken primarily because I delighted in the Nō, and the labour of bringing it through the Press was rendered lighter by the hope that it might give pleasure to the English reading public to see, even “through a glass darkly,” something of the beauty of this unexplored literature. I have already described the effect these plays have on the Japanese and on me. That I have caught perhaps an echo of their spirit I am encouraged to think, because on the two occasions when one or other of these translations have been read to audiences it has been reported to me that several of those who heard them were in tears. That strikes the right note. For with all their literary richness and their descriptions of beautiful scenes and of heroic deeds, the ground note of the Nō is human tragedy. Their tragedy is of the fundamental, elemental kind that depends upon the very nature of our being, that turns upon the terrible fact which the trivialities of the material world so readily delude us into forgetting—that we are fleeting as a drop of dew. This piece is now commonly attributed to Kiyotsugu, and is supposed to have been produced at the end of the fourteenth century. Its exact date is not known, but Kiyotsugu was born in 1354 and died in 1406; yet it is most likely that he was an adapter and not the original author of the utai, parts of which were probably written long before his time. The play is still one of the most important of the Nō, and is indeed a test piece, as parts of the Shite’s chanting are exceptionally difficult. A foreigner cannot judge of this, but from my own point of view it is perhaps the finest of all the Nō. The play is based on a story told—or rather written down, for it was probably told long before then—a thousand years ago in the Yamato Monogatari, or Tales of Japan. It is the story of the love of two men for one woman, and the fatal consequences thereof for all concerned. UNAI, a maiden living near Ikuta, was loved by two equally gifted men. On the selfsame day they each sent her a letter declaring their passion, but she could not decide between them, fearing the anger of either rejected suitor. Her father determined that the one who shot most accurately should win her, but in the contest the two men pierced the same wing of the same bird with their arrows. This bird was a mandarin duck, a creature whose lifelong faithfulness to its mate was proverbial in Japan. The girl felt bitterly that she was to blame for the death of the bird and the misery its mate endured, as well as for the strife between the two men. Hence she drowned herself. Then the two men, visiting her tomb, were filled with remorse, and killed each other beside her grave. This, however, only added to the girl’s guilt, and much of the play is taken up with vivid descriptions of her agonising torments in the eight hells believed in by popular Buddhism. The play opens with a traveller Priest passing the village of Ikuta on his way to the capital. It is early spring, and the village maidens are out gathering the first green shoots of the “seven herbs,” which used to be eaten at the beginning of the year as a kind of ceremony. The city folk make this herb-gathering a pleasure picnic, but the poor girls going out of necessity into the biting cold of January are envious of those who are better off in cities. The spirit of the long dead UNAI has joined them in the form of a young girl, but she takes part in the opening dialogue. The “Maiden’s (i. e. UNAI’S) Tomb” is one of the famous places in the district, and the Priest asks to see it. UNAI’S spirit remains behind when the village girls have been driven home by the cold, and she conducts the Priest to the tomb, conversing with him, and telling him the story of UNAI. Her spirit’s materialisation as a maiden then vanishes, and UNAI appears as a Ghost, for whom the Priest prays. The Ghost laments over the tomb, and the Chorus gives expression to her longing for the human world. The Ghost expresses her thankfulness for the prayer uttered by the Priest, and recounts her agonising sufferings in the eight hells. The Priest makes some effort, but not a very determined one, to inculcate in the poor Ghost the higher Buddhistic belief that all these things, even the hells, are delusions, and her mind could free herself of them. The play closes with the Chorus telling of her miseries in hell. In its construction, and its presentment of the story as a whole, this play resembles strikingly one of the beautiful tryptic colour prints of Japan, in which an exquisite, softly coloured garden or woodland foreground, shaded with delicate mists, brings into intense relief the vivid figure of an armoured warrior going out to battle. In the opening passages of this play we have the soft, misted foreground, with the tender green shoots of the early spring-time. One sees the thin, frosted ice pushing aside the sprouting plants, and the scene is enhanced and the description of it embroidered by poetic references to the details of the picture. But among the maidens is one, outwardly like others, so that they do not recognise the difference themselves, but yet one who is a tragic figure, a temporary reincarnation of a spirit from hell. Then with the Priest the spirit converses, and paints in vivid colours this central figure, for whom the whole scene forms but the setting. To us in the West the moral attitude of the play seems very strange. From her initial ‘sin’ in being sufficiently beautiful to attract the love of two men, and her guilt in causing the death of the mandarin duck (in a Buddhistic country no small crime), we see crime after crime laid upon the maiden’s head. And all the time in our eyes she appears utterly innocent of everything save a too ready yielding to a tender conscience, and a willingness to take blame upon herself. Hapless maiden, how different is this treatment of hers from that accorded in the West to charming girls. In Old Japan not all the eight hells would have been accounted sufficient for Helen of Troy. In its religious attitude we see the popular beliefs of Buddhism contrasted with the higher form of the same religion. The circumstantial details of the hells and punishments were believed in by the common folk, but as the Priest says (on p. 49) all was delusion, both in the world and in heaven or hell, and the soul could escape from its torments by a recognition of this higher fact. If only thou wouldst once but cast away The clouds of thy delusions, thou wouldst be Freed from thy many sins and from all ills. This illustration, from a Japanese coloured woodcut, shows the figure of the maiden Unai (see p. 35), who wears a dress resembling that still worn by country maidens, though with the volume of the garment and the size of the patterns both a little more exaggerated than those which are now customary. The designer of the woodcut has put in symbolic and formalized representations of the Mandarin ducks and the flames of hell-fire which were among Unai’s torments. The fields of ONO near the hamlet of IKUTA in Settsu, in the early spring. Far through the country has my journey lain, Far through the country has my journey lain, And to the capital I speed my way. I, a priest, am from the country, from the Western districts coming. To the capital, which hitherto my eyes have never seen. The paths along the coast are manifold, The paths along the coast are manifold, That on this journey I have traced, and oft My way has lain by boat across the sea. Over the sea and mountains stretching wide I watched the sun rise up and set again, And now I reach Ikuta which I know Only by name as in Tsu province fair, The hamlet of Ikuta now I reach. Green shoots we gather, young green shoots of spring, And here in Ono by Ikuta blows The morning breeze so chill, so chill and strong It turns and billows out our flapping sleeves. While in the distant mountains, on the pines The snow has even yet not disappeared. Oh, near the Capital the time has come To gather in the fields the shoots of spring. It makes our hearts glad just to think of that. And we are country folk and therefore live A humble life here by Ikuta’s sea. Our lives and work are of the lowliest And to the field of Ono every year Without the thought of pleasure do we come. The footmarks of the many village folk That go to gather the young shoots of spring Have left wide tracks across the snowy field. And tread a path, where else there would be none. And tread a path, where else there would be none. The young green shoots that grow on field and marsh We now must gather. When the snow has gone They will already have become too old— Though still the wind blows cold thro’ shady copse And on the field of Ono lies the snow, The seven herbs of early spring-time sprout In Ikuta then let us pluck the shoots, In Ikuta then let us pluck the shoots. O good people, will you tell me if toward Ikuta I’m nearing? As thou dost know the name of Ikuta There should have been no need to ask us that! Dost thou not know it from the many views That scattered far and wide portray the place? First of all, dost thou not know it as the forest of Ikuta? See, the many clustered tree tops which are true to this its name. And there the stream thou hast now deigned to cross, It is the far-famed river Ikuta. In the early breath of spring-time (like the shallows of the river) Do we gather, ’neath the snowy cloak, the young shoots of the field. And this field, too, where little sprouts as yet Are growing, why as Ono know’st it not? The sweet wild cherry blossoms that do grow In Miyoshino and in Shiga too, The maple leaves of Tatsuta and those Of Hatsuse—they would be surely known By those who lived beside the poet’s home. But we, though living in this place know not The forest or the copse of Ikuta. So ask us not, for we know nothing here. Ah yes. Unfolding now before my eyes The views I know—the forest, river, sea, And mist, the scenes of Ono now expand! And the far-famed tomb of Ikuta, the Maiden’s Tomb, where is it? Ah, in truth, the Maiden’s Tomb! That is a place that I have heard of; Whereabout it is I know not, yea, I know not in the least. But prithee, traveller, these useless things We beg thee ask us not, we prize the time When we can gather these young shoots of spring. And thou thyself, too, journeyest in haste, So wherefore dost thou tarry with us here? “A charming hindrance to the traveller Are they who pluck young shoots in Ono’s field In Ikuta.” Why ask then useless things? “Thou, Watchman of the field of Tobuhi That lies in Kasugano, go and see,” “Thou, Watchman of the field of Tobuhi That lies in Kasugano, go and see If it is not yet time to pluck the shoots.” Thou, traveller, that to the capital Likewise dost haste, how many days hast thou? “For his sake do I go to the spring fields To gather the young shoots, though on my robe Cling still the cold, unmelted flakes of snow.” Let us then gather, snowy though it be And on the marsh the thin ice still remains, Pushing aside the sprouting watercress, Let us then gather the green-coloured shoots Let us then gather the green-coloured shoots. Would there be much to gather? For the spring Is very early yet—and young shoots hide. “The spring-time comes, but as I see the snow Upon the plain, I think of the old year.” The young green shoots of this year still are few So we must gather those with older leaves. And yet, although the leaves are old and sere The young green shoots are fresh as the new year. Guard then thyself, thou field of the young spring! To the field of spring, To the field of spring, To pluck violets He came, and then Only purple leaves Of the weeds culled he Who came gathering. Ah, yes, the colour of affinity Has brought to my sad thought the memory Of Love’s light bridge which was asunder torn. And their green colour will be purple dyed. And the hot shepherd’s purse, a useless thing, And other herbs white rooted, like the dawn, Which, hidden by the snow we may mistake And gather in the place of those we want. The morning breeze in Ono still is cold The lower branches of the pine trees still Are weighted down with snow. Where hides the spring We cannot tell. And though the river breeze Blows cold, our billowing sleeves are colder far. Let us go home, although we leave unplucked Some of the young green shoots, let us go home. Now there is something I would speak of unto thee if thou permittest— All the maidens who were gathering the young greens have departed Save thyself, and wherefore then art thou alone remaining with me? For the Maiden’s Tomb but just now thou didst ask me. I will show thee. Yes, indeed, I do desire to see it and I pray thee show me. This way honourably follow. And the Maiden’s Tomb is this! What its history, and why then, is the Maiden’s Tomb so calléd? Pray minutely tell the story. Then will I the tale unfold. Once upon a time a maiden who was called Unai did live here, And two men there were, called Chinu and Sasada, and they loved her. And to her upon the same day, in the same hour, both declaring Fervent love, they sent two letters. But she thought that if she yielded Unto one, the other’s anger would be deep, and so to neither Would she yield (and then her father said the truest shot should win her). But upon Ikuta’s river did the two men’s flying arrows Pierce together but one water-fowl, and pierce the selfsame wing. And then I thought, how cruel now I am. The wild fowl’s troth, though plighted deep and true Is broken for me, and the happy pair— Mandarin ducks—for my poor sake must bear The pain of separation. Piteous! So, with my life dismayed, I’d throw myself Into Ikuta river’s flowing tide Here in the land of Tsu. Ikuta stands Merely a name to such a one as I. These were her last words, as she took her way Into the river’s water. When they found They buried her beneath this mound of clay. Then the two men, her lovers, came to seek Her tomb. No longer will we live, they said, And like the stream of Ikuta, the tide Of their remorse rose up. Each with his sword Ended the other’s life. And that was too my sin! That too my sin! What can become of such a one, so full Of sins? I pray thee therefore give me help! So saying ’neath the tomb once more she sank Yea, down beneath the tomb once more she sank. Oh, the wide field, how desolate it is— My own deserted tomb and nothing else! Only wild beasts contending for the dead Which come and go in gloom, and o’er the tomb The watching spirits flying in the wind That circling ever beats upon the pines. The heaven’s lightening, and the morning dew Are still before my eyes, and symbolise The world of Earth, as transient as they. How many of the lonely tombs are those Of Youth, whose lives are so unlike the name Of Ikuta, so-called the field of life. A man comes from the world I left long since. How thankful am I. ’Tis the voice of prayer! O human world. How much I long for thee. A [living] man while spending [in this world] Even a single day and single night, A [living] man while spending [in this world] Even a single day and single night, Eight billion and four thousand things has he To think about. But how much more have I, I, who left long ago the pleasant world— ’Twas in the reign of Tenchi and by now The second Horikawa holds his sway. Oh, that once more unto the pleasant world I might return. How long in shady weeds And ’neath the moss, how long I buried lie! But worse, not buried under the cool earth I suffer from a roasting heat and burn, Within a flaming dwelling-place, behold! Within a flaming dwelling-place, behold! Alas! How truly piteous is thy state, If only thou wouldst once but cast away The clouds of thy delusions, thou wouldst be Freed from thy many sins and from all ills. “From evils all, and sins, from hells and fiends, Illnesses all and deaths, be thou set free.” Oh, quickly float thyself in buoyant thought! Ah, grateful am I, for the voice of prayer Has reached my ears, and tho’ my sufferings Do know no intermission, in hot hell The smoke clears back a moment, and I see A little open space. How glad I am! Oh, how terrible! Who art thou? What! Of Sasada the spirit? And thou art the ghost of Chinu? And from right and left you hold me By the hands, and saying to me “Come, come, come.” Though they torment me I don’t dare to leave the shelter of my burning house; for no one, Nothing, is there to rely on. And I see another spirit Flying from afar towards me. Oh, how terrible! I see it, ’Tis the duck, and turned to iron, turned to steel it is before me! With beaks of steel like naked swords the bird Pecks at my head and feasts upon my brain. Is it because of crimes I did commit? Oh, how resentful is it, cruel bird! Oh! I pray thee, Priest, I pray thee, from these sufferings relieve me! “The time of torment fierce has now arrived.” The spirit had not finished saying this, When o’er the tomb flew out a band of flame. Who raised the torture rod, and drove at her. While flames are in the rear. And on the right as well. By water and by fire am I now held In double torment. I reach my hands, and do attempt to cling At once the column bursts out into flame— The blazing pillar must I then embrace. Oh, scorching heat! Oh, unendurable! The whole five members of my body turned Into black smoke by this fierce burning fire. And then when I arose, a jailor fiend Applied the torture-rod, and drove me out. I left the house and wandered through eight hells And there all suffering I underwent. Now I would show thee how I blotted out My many sins. Before thee lie the scenes First in the hell of all equality, Then in the hell of black rope, devil led, And driven to the hell of gathering, Where all assemble. Then the hell of cries, Of bitter cries, came next, and then of heat, Of utmost heat, and then the hell of depth, Depth infinite, into whose space I fell Feet upwards and head downwards for three years And three months more, in agony the while. And after that a little interval— The devils left me and the flames expired, I thought there was a respite to my pain, But then the darkness grew more terrible And to my burning house I would return I thought—but where then was it? To myself I asked the question in the pitchy dark. And seeking, seeking, to and fro I groped. “The Maiden’s Tomb”—I searched it everywhere, And now at last I find “The Maiden’s Tomb.” Like flying dews leaving a grassy shade, Like flying dews leaving a grassy shade, The spirit’s form has once more disappeared The spirit’s shadow has now vanished. This Play was probably written about 1410; at any rate in the first quarter of the fifteenth century. Its author was Motokiyo, who was born in 1374 and who died in 1455. He was the eldest son of the famous Kiyotsugu (see p. 7). Kagekiyo, known as the Boisterous, owing to his uneven temper and ready appeals to arms, was a famous warrior of the Taira clan, and when the Minamoto Shōgunate was established at Kamakura, Kagekiyo was exiled to a distant place in Hiuga, where he became blind and passed a miserable existence as a beggar. He had a daughter called Hitomaru, whom he left in Kamakura in the charge of a lady. At the time of the play, Hitomaru has just grown up to be a young lady, but she had a great desire to meet her father, and so set out with a servant to seek him. She has a long and arduous journey to the place of her father’s exile, and after enduring considerable hardships she at last finds Kagekiyo’s retreat. She and her servant encounter a villager who assists them in the final search for Kagekiyo, and they make inquiries of a blind beggar dwelling in a miserable straw hut. This beggar is actually Kagekiyo, but at first he refuses to answer them or to acknowledge it, out of shame and consideration for his daughter. Ultimately, however, he recounts to her some of his adventures, and then he commands her to leave him and they part for ever. In this play there is perhaps less description of the beauties of Nature than in many of the Nō, but the opening lines are particularly fraught with the meaning which permeates the whole play. The dew remains until the wind doth blow. Nay, in the three worlds there is not a place. Kagekiyo’s behaviour to his child, and his reception of her after her long search for him, appears to us to be most cruel; but it is, nevertheless, based on the conceptions of the chivalry of his time. Kagekiyo’s leading thought was the really unselfish desire to keep the shame of his condition from touching his daughter. His first wish is that she shall not even recognise or speak with him; but when this is frustrated, he commands both the servant and the villager to send her back immediately their short meeting is over. And yet he does not seek even a moment’s embrace, nor does he use an endearing phrase to his daughter. The play is a good illustration of the way that the old codes of Japanese chivalry imposed courses of action which seem now in this softer age well-nigh inhuman in their repression and conquest of the natural feelings. A mountain side at Miyasaki in the province of Hiuga. Time about 1190. The dew remains until the wind doth blow, The dew remains until the wind doth blow. My own life fleeting as a drop of dew, What will become of me as time does pass? My name is Hitomaru, and I am A maiden, who in Kamakura dwells. My father’s name is Kagekiyo, called By some the Boisterous, and he is a friend Of the Hei clan, the Taira family And so is by the Gen house hated much. To Miyasaki exiled, in Hiuga He deigns, in shame, long months and years to pass. To travel unaccustomed, I am tired, And yet inevitable weariness I mitigate by thinking of my quest, And I am strengthened for my father’s sake. The tears of anxious sleep run down my cheek And to the dew upon the pillowing grass Add drops that drench my sleeves. From Sagami the province we set out, From Sagami the province we set out, Asking from those we met, the road to take Toward our destination. And we passed The province Tōtōmi, and crossed by boat The distant bay. And Mikana we passed, By Mikana, spanned o’er with bridges eight. Oh, would that we could grow accustomed soon To our short nights of sleep that we might dream Of the high capital above the clouds, Of the high capital above the clouds. Endeavoured as you honourably have To hasten on the way, already now This is Miyasaki, as it is called, To Hiuga you have honourably come. This is the place to honourably ask Your honourable father’s whereabouts. The pine trees that have seen long months and years Entwine themselves to form the arching bowers. Yet I, debarred from the clear light of day Discern no sign that time is passing by. Here idly in a dark and lowly hut I sleep the time away. The seasons change But not for heat nor cold my clothes are planned And to a skeleton my frame has waned. If one has got to leave the world, then black, Black should his sleeves be dyed. Then surely black His sleeves should all be dyed, and yet my sleeves— Oh, more inglorious! So utterly Worn out and waned my state that I myself Feel much averse unto my wretched self. So who could be benevolent enough To visit such a state of misery? No one inquiring of my misery Will ever come. No one inquiring of my misery Will ever come. Incredible that one should dwell within That wretched hut, it does not seem to be Fit for a habitation. Strangely though I heard a voice proceeding from its wall. A beggar’s dwelling it must be. I fear, And from the lowly dwelling keep away. That autumn now has come I cannot see, And yet I feel it for the wind has brought Tidings from somewhere, tho’ I know not whence. Ah, knowing not my father’s whereabouts In misery I wander, with no place Where I can rest even a little while. Nay, in the three worlds there is not a place, ’Tis only in the heavenly expanse. Choose any man and ask him, he will say “Where else!” And what else could he ever say? How now, you in the thatched hut, I would ask A question of you. Well; what is it then? Knowest thou where dwells an exiled man? An exile though he be, what is his name? The Boist’rous Kagekiyo is he called, And of the Taira house, a warrior. Yes, yes, I think that I have heard of him, Though being blind the man I’ve never seen. Miserable, his honourable state! To hear of which stirs pity in my breast. Pray then inquire elsewhere the full account. Then hereabouts he does not seem to be. But further on we should inquire again If you will honourably now proceed. She who has just been here—Why! is she not The very child of this selfsame blind man? Once, very long ago, at Atsuta I met a woman, and this child I got. It was a girl, and so I trusted her To Kamegaegatsu’s châtelaine. Now grieving parent meets with child estranged; She, speaking to her father, knows it not. Her form unseen, although I hear her voice, How sad my blindness is! Without a word I let her pass. And yet such action is Due truly to the bond of parent’s love, Due truly to the bond of parent’s love. How now, you there! Art thou a villager? And to the Villager what hast thou then Of honourable business? Dost thou know Where lives an exiled man? What sort of man— An exile though he be—of whom you ask? A warrior of the Hei house, and called Kagekiyo the Boist’rous, him I seek. Just now as thou hast come along this way Upon the hill-side, was there not a hut, A hut with thatch, and somebody within? Yes, a blind beggar sat within the hut. Aye. That blind beggar is the man you seek, The very Kagekiyo whom you seek! How strange! When I said Kagekiyo’s name That honourable lady there did deign To show a look of sadness. Why was that? Thy wonder is most reasonable. Naught Shall I conceal from thee. Kagekiyo’s Most honourable daughter is the maid Who hopes once more her honoured sire to meet. That being so, and as from far away She has come hither, I pray thee devise Some proper way of speaking face to face With Kagekiyo. Oh, unutterable! Is she his honourable daughter then? Well, calm your heart, and pray you deign to hear. The sight of both eyes Kagekiyo lost; So helpless, he cut short his hair and called Himself Kōtau of Hiuga and he begs For his poor living from the travellers, And with the pity of such lowly folk As we ourselves, he just sustains his life. And that he doth not tell his name must be Shame for the contrast with the olden days. At once I shall go with you and call out “Kagekiyo”—and if it is his name Then will he answer and you can observe Him face to face, and of the distant past And of the present you shall tell him all. Pray come this way. Holloa! in the thatched hut Is Kagekiyo there within? Is there The boisterous Kagekiyo? That name in Hiuga facing to the sun, In Hiuga, facing to the sun is not The name they call, but they return to one Of the old days, discarded long ago, Which with my helplessly dropped bow I dropped. Wild thoughts again I never will excite And yet I’m angry. Though while here I live In this place. While I live In this place; if I stir the hate of those With means, how helpless would I be! and like A blind man who had lost his walking-stick. A crippled man am I, and yet I dared Unreasonable words to use in wrath. Forgive I pray! Blind are my eyes and yet I surely know Another’s thought hid in a single word. And if upon the mountains blows the wind Against the pine trees, I can tell its source, Whether it comes from snow or unseen flowers,— Flowers only seen in dreams from which to wake Is to regret! Again if in the bay Upon the rough sea beaches dashing waves Are heard, then I well know the evening tide Is rising. Aye, to the great Taira clan I do belong, and so to pleasure them I’d give recitals of those olden days. How now, I wish to say a word to thee, For it has troubled me that I just now Used such quick-tempered words. For what I said I pray thee pardon me. Well, that is naught. So never mind it. And, has no one come, To make inquiries here before I came? No, no. Except thy calling, none has been. Ho! ’Tis a lie thou sayest. Certainly Did Kagekiyo’s noble daughter come. Wherefore dost thou conceal? It is because I feel her story is so pitiful That I’ve come here with her. Pray, it is I, I who have come to you. Cruel! The rain, the wind, the dew and frost I minded not along that distant road, While coming to you! And all this, alas, Becomes as nothing! Does a Father’s love Depend upon the nature of the child? Ah, heartless! Up till now I hoped to hide, But now I am found out I am ashamed. To hide my fleeting self there is no place. If, in thy flowering form thou shouldst proclaim That we are child and parent, then thy name Thou wouldst announce, and when I think on this I am resolved we part. Pray do not feel Thy father harsh and this mere heartlessness! Ah, truly is it sad! In olden times I welcomed even strangers when they called, And was displeased if they should pass me by. And now its recompense! How sad it is! To think that I had hoped that my own child Should not have called on me. Alas, how sad! When in their warships were the Taira clan, When in their warships were the Taira clan, So many were there that their shoulders touched And in the crowded space the knees were crossed. There scarce was room to live beneath the moon— And Kagekiyo more than any else Was on the flagship indispensable. His fellow officers and all the rest Though rich in valour and in tactic powers He did o’ertop. And as the ship is steered By him who holds the rudder, so did he Lead in the army and no difference Ever occurred between him and his men. All envied him, but now he is most like A Unicorn, infirm with hoary age And rather worse than a mere useless horse. How now, Kagekiyo, I’d speak with thee! Thy daughter’s wish is there, and she would hear Of thy heroic deeds at Yashima So tell her the brave story. Let her hear. ’Tis somewhat unbecoming, her request! Yet as she came from far and for my sake, I’ll tell the story, but when it is done Pray send her home again immediately. That shall be done. Thy story finished, I Will send her back at once. Well then. The time Was drawing toward the end of the third month Of the third year of Ju-ei, and our clan Were in their warships while upon the land The hordes of Minamoto gathered near. Two armies were opposed upon the coast And each one wished a contest to decide. Then Noritsune, Lord of Noto, spoke To all his people—“In our last year’s fights From Muroyama down in Harima To Mizushima, Hiyodorigoe And all, we never had one victory. To Yoshitsune’s tactics this was due. “By some means or another we must slay This Kuro, and suggestions we desire Of some good plan;” he deigned to say to them. Then Kagekiyo in his mind resolved That Hangwan was no devil nor a god, So if I throw away my life for his, I thought, it will be easy, so that this To Noritsune was my last farewell. And as I landed the Gen warriors Did dash towards me to destroy my life. This Kagekiyo saw, This Kagekiyo saw, and crying out “How clamorous!” He struck out with his sword That in the evening sun flashed brilliantly. Th’ opposing warriors at once gave way, And he pursued, that they should not escape. This is deplorable for every one! ’Tis mutual shame alike for the Gen clan And for the Hei clan to look upon So shouted I—thinking to stop one man Is easy, and so underneath my arm Carrying my sword—“A warrior am I Of the great Hei clan, Kagekiyo Some call the Boisterous,” and thus crying out To seize them I pursued them. Then I caught On Mihonoya’s helmet, but it slipped. Again I caught, but once again it slipped And thus three times did he escape, though I Determined that he should not flee, for he, He was the foe that I had chosen. Eiya! As with the whole strength of my arms I pulled, and as I hauled the cape broke off, And part stayed in my hand, but he escaped. When at some distance from me, he turned back And said, “Now thou art mighty strong of arm Although thou didst allow me to escape.” Then Kagekiyo answered back, “The strength Lies in the neck bone of Mihonoya.” So smiling, did we part to left and right. He who has told the tale of olden days— Days ne’er forgotten—is now sadly waned And e’en confused in mind. Ah, what a shame! The end of all this woe of life is near, For in this world at most my time is short. At once return, and when I am no more I pray thee deign to offer prayers for me. That in dark places there shall be a light For this blind man, and over evil roads A bridge. So will I look upon thy prayers. “I stay,” said he, and she “I go,” His ears retained but her one word “I go.” And thus between the parent and the child This was the legacy at last exchanged— Between the parent and the child exchanged. Shite: The Spirit of TAMURAMARU, a renowned warrior, in the first part appearing as a youth, and in the second as a warrior. The temple ground of Kiyomizu in Kioto, in March. The shrine of Tamuramaru is erected in this ground. There are only two actors in this piece, and it is even less dramatic than the preceding. As it does not lend itself so well to complete translation, I shall give the piece merely as a résumé, with a few of the more beautiful lines rendered in extenso. This drama is an admirable example of the use of a delicately toned, flower-like foreground, as a setting for the warlike figure who recites tales of his strenuous life, which is so characteristic of the construction of the Nō. The PRIEST enters first, and, as is often the case at the beginning of a Nō, he recites an account of his hurried journey in the spring, past the provincial capitals to the “nine-fold capital of the Emperor” (Kioto). He speaks of the mild sky of the spring with the sun shrouded by soft haze, and announces that he has now arrived at the Temple of Kiyomizu (meaning clear water) with its peaceful waterfalls. Beholding the Youth sweeping the petals, the PRIEST asks him if he is the flower keeper. To this the YOUTH replies in the affirmative, saying that he serves the Goddess of the Temple and that as he always sweeps the petals in the season he may be looked on as the flower keeper, or at any rate as one in the service of the Temple. The PRIEST then asks him to relate minutely the history of the Temple. Into this narrative the Youth plunges directly, stating that the Temple was built in the second year of Daido and founded by the wish of Tamuramaru of Sakanoue. He continues to relate that there was once a priest called Kenshin who had a great desire to behold the real form of Kannon, and after his prayer he once saw a golden-coloured light on the upper stream of the river Kotsu. He followed it and found an old man, who said that he was Gyoe-Koji and told Kenshin to discover a patron who would found a magnificent temple. But this so-called Gyoe-Koji was really Kannon herself, and Tamuramaru was the patron of whom she spoke. The CHORUS then speaks, for the Youth, of the universal benevolence of Kannon, symbolised by her thousand merciful hands, every one of which is ready to be extended to those in need, in answer to their prayers. The PRIEST declares that he has met an interesting person, and asks for further information about the famous places around, questioning the Youth about one to the south, where a mound is to be seen, and then one to the north, whence an evening bell is heard. The YOUTH, after replying that the one is the Seikan Temple and the other the Temple of Washinowo, both famous in poetry, calls the attention of the Priest to the moon rising from behind the Otowa mountain, and observes that as the moon casts its peaceful light upon the cherry blossoms it is a sight truly worth seeing. This is a season to be prized indeed, This passing moment of a heartless Time That flies so swiftly in the midst of Spring. The moon between the cherry trees shines clear And petals softly falling in the breeze Dance in the air like gleaming flakes of snow And make our hearts dance with them, light and glad. A second chant of the CHORUS enlarges on the beauty of the flowers, the greenness of foliage, the softness of the breeze and the charm of the waterfall of Otowa, and concludes by referring once more to the merciful light of the Goddess of the Temple, which is extended even to inanimate objects, such as trees, and which accounts for the exquisite scenery of the surroundings. The CHORUS then asks (for the Priest) the name of the Youth, who does not appear to be an ordinary person. To this the YOUTH replies: “A nameless man am I, but if thou wishest to know who I am, observe where I am going.” The CHORUS explains that the Youth then opens the door of the Shrine of Tamuramaru, which is brightly lit by the moon, and disappears within. The PRIEST observes how strange it is that he sees a manly figure in the light of the glittering flowers, and asks who it is. To this TAMURAMARU replies that he has now nothing to conceal, and begins to tell the story of his life by stating that in the reign of Emperor Heize he was Tamuramaru of Sakanoue, who was to conquer the Eastern barbarians, the fiends, and that by the help of the Goddess of this Temple he had power to do it. The story is then told by the CHORUS, who recounts that, according to the Emperor’s declaration, the powerful and rebellious fiends in Seishu must be put down and peace must be restored. Tamuramaru collected the army, and when ready to start he came to this Temple and prayed to Kannon that he might gain the victory. “There was a strange but good omen,” breaks in TAMURAMARU, and the CHORUS goes on to recount with what exultation he set out at once to strike at the rebels. Another chant of the CHORUS describes the march of Tamuramaru and his army to the seat of the rebels. They travelled far, going over the mountain pass of Ōsaka and through the forest of Awazu; stopping to adore the Temple of Ishiyama, noted for its mirage, where also Kannon is enshrined; and crossing over the long bridge of Seta, which resounded gallantly as horses trotted over it. At last they reached the province of Isé (or Seishu), and, convinced of their victory, for they were waging a just war, were more encouraged than ever, every one of them desiring to show his bravery and strike the first blow at the rebels. Happily, moreover, with the help of Kannon, the fiends, though they were numerous, were unconscious of their arrival. The CHORUS then describes how the fiends came on in battle, raising thick clouds and pouring down iron-fire, and by their magic art creating thousands of armed men. They looked like the sea of Isé, or the forest of Ano, so mighty were they and so numerous! TAMURAMARU breaks in: “There behold, how astonishing!” and the CHORUS goes on to explain that over his own army the light of the thousand-handed Kannon appeared, flying in space, with a bow of mercy and arrows of wisdom in each of her thousand hands, so that the arrows poured down like rain and hail over the enemy till all were struck and not one was left alive. Hence it was by Kannon’s power that the victory was gained, and to her should be rendered eternal gratitude. The play, which was written essentially in praise of the virtues and powers of Kannon, is attributed to Motokiyo, the author of Kagekiyo (see p. 53). 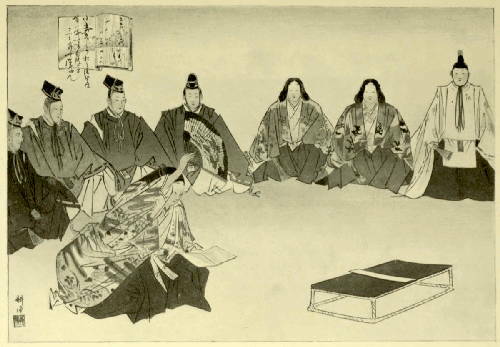 The play is attributed to Motomasa, who was a grandchild of the famous Kiyotsugu (see p. 7) and who died in 1459. The exact date of its composition is uncertain, but it was most likely within the first half of the fifteenth century. A little child, the only son of his widowed mother (and owing to the laws regarding the continuation of families in Japan that means much more there than it does in Europe), was kidnapped from his home. The play opens a year after this had happened, and we meet the mother hurrying toward the Sumida river, which she crosses in the ferry. She has had a long journey from the City Royal (Kioto) in her search for the child. While she is in the ferry, the ferryman tells the passengers of a festival to be held in the place that evening in memory of a little lad who died on the road just a year ago. The mother questions him, and learns that it is her child for whom the villagers are about to meet in prayer. The ferryman prevails on her to join in the prayers, and for a moment the ghost of the little one appears and speaks with her. This illustration from a Japanese coloured woodcut is not so good as could be desired, but was the only one available. It shows the Mother on the left, and reveals the simple, open way in which the actor wears the woman’s mask. The little rectangular instrument at her feet is that used for striking the gong of prayer (see p. 92). The small figure to the right is the ghost of the little son who died, and whom she has set out to seek. Notice his entirely unnatural wig of hair. In the square insets above him are representations of the “Birds of the City Royal” (see p. 83) spoken of so much in the text, and the words “I adore the Eternal Buddha” in Chinese ideographs. If one but waits The wind vibrates The branches of the pine trees till they speak. Throughout the piece also there are very many allusions to and plays upon classical verses, particularly in relation to the “Bird of the City Royal” and Narihira’s poems (see p. 83). The predominating thought in the piece, however, is the Buddhistic conception of the transitoriness of human life, and of the frail nature even of the bond that unites a loving mother and her child. Fleeting as are the gleaming drops of dew, Desolate as the moor of Makuzu In autumn, is this world of lost delight. The banks of the Sumida River in the province of Musashi, toward evening. I am he who plies the ferry in the province of Musashi, Over Sumida, the river, known to many far and wide. And to-day my boat must hurry with its many loads of people, For our village holds a festival of universal prayer. On this day both priest and layman with no thought of their distinction Will remember this great matter and assemble one and all. The goal of my long journey is the East, The goal of my long journey is the East, Far Azuma, and like its distance stretch My days of travel, long in weary thought. From the capital I travel, I who now am speaking to you, And I journey on to Azuma to visit there a friend. Behind me rise the mountains I have passed Faint in the distance as the clouds and mists. Behind me rise the mountains I have passed Faint in the distance as the clouds and mists. O’er many a mountain path my way has lain, Wide province after province have I crossed. Before me now lies the great Sumida, The river of renown, and at my feet The waiting ferry do I now behold, The waiting ferry do I now behold. I have hurried, for already, ’tis the ferry of the river, And behold, the boat is leaving, I must enter it at once. What ho! Boatman! stay a moment. I would travel in your boat. Very good, sir! Now at once though, may it please you to get in. Yet I first would like to ask you, what is that loud noise behind you, There behind, whence you have travelled. What’s the matter, may I ask? ’Tis a woman who is coming from the capital and acting Like a mad thing in a queer ecstatic way. I saw her there. Oh, in that case let us tarry till the mad thing can o’ertake us, We can stay the boat a little, for this way she’ll surely come. Darkness entire can never hold its sway Within a mother’s heart, and yet for love Of her sweet child she is a wanderer. Ah! painfully I know for the first time The bitter truth contained within these words. I ask all those who pass Along the snowy way To Azuma to say Where lies my little love. There is no news. Alas! No answer can I find. Shall I then ask the wind That blows unseen above? If one but waits The wind vibrates The branches of the pine trees till they speak. If one stays still He often will Have brought to him the tidings he does seek. Fretted with sorrow pass her day and night. I am a woman who had lived for years At Kitajirikawa in the capital; When suddenly I lost my only child, Lured from me by a man who kidnapped him. They told me that beyond Ōsaka’s pass, Far to the East, to Azuma, he went. And since I heard it I have felt my mind Losing its hold on ordinary things, Set only, full of love, upon the way The child did follow. Tracing out the marks Of his dear feet, I wander here and there. Thousands of miles the journey is in length, Yet never does the parent’s heart forget The child she loves and seeks. So do we hear. The nature of the bond is transient, The bond is transient in this world, and yet Parent and child are destined not to live In loving union even this short while. But, like the four birds in the fable old, Between them cruel separation lies. And now, alas! the mother’s loving search Of her young child has come to its sad end, For she has reached the river Sumida, The river Sumida that flows between The province Shimotsuke and Musashi. Pray, O Boatman, kindly let me also enter in your ferry. Who, then, art thou? Whither going? And from whence hast thou just come? From the capital I travel, to Azuma, seeking some one. As thou art, then, from the city, and seem also to be mad, Entertain us, show us something that is curious or funny. If thou do’st not, I’ll not let thee travel now upon this boat. Thou deign’st to say that I am from the city, And by the custom, must not use thy boat. But o’er great Sumida thy ferry passes, And so thy words do scarce become thee well. It is true; thou art a person from the distant City Royal, And thy gentle nurture tallies with its reputation here. Bird of the Royal City—come! I ask of you a boon, if true, The name that they have given you: Is she alive—the one I love— Is she? Or is she not? Pray, O Boatman, over yonder is a white bird that we know not In the capital. By what name do you call it in this part? That bird is indeed a seagull, flying in from the wide ocean. They may call it gull or plover, what they wish to by the sea, But when standing here by Sumida with that white bird before us Why did you not name it rightly, as the Bird of City Royal? Yes, truly, truly, I have sadly erred. This is the place far famed for that same bird. I had in very truth the thing forgot And though this is the place the thought came not. The gull of the wide sea brings to thought The waves of the evening tide. And the roll of the waves to our minds has brought The past when Narihira cried. “Is she or is she not?” To the Bird he spied. His thought was a lover parted from his side. The same thought guides me, for I seek My loving child. To all I speak, Asking if any news there be Of where my child lies hid from me. O Bird of the Royal City, come! For I ask, too, a boon of you. In Azuma, the child I love Is he, or is he not? Ah! though I ask and ask, it answers not! Vexing art thou! Bird of the Royal City— A country bird wouldst thou be better called! Yet this same bird comes singing to the banks Of Horie River, where the boats race past. That river is in Naniwa, and this The Sumida, flows down through Azuma. When one reflects on this, how vastly far In my lone journey do I seem to come. That being so—— Lo! Ferryman, I pray The boat is full, but still is room for me, So let me enter, Ferryman, I say, So let me enter, and then push away. Such a tender-hearted, mad thing as this woman never has been! Come aboard at once, but notice that the ferry is a swift one. Take good care to step in gently. [To the Traveller] You, sir, too, I pray come on. May I ask, what is that yonder where the people by the willow Are assembled in great numbers? Why should they be waiting there? Well, that is a public meeting for a universal prayer. I would tell you, while we’re crossing, if you’ll listen to the tale, The sad story in connection with this festival of ours. It was last year, in the third month, on the fifteenth day, I reckon, Yes! That is so, and to-day we have the very selfsame day, That a kidnapper did journey from the capital, and with him Was a lad whom he had purchased, twelve or thirteen years of age, He was going to the north-east, but the child was not yet hardened And the long fatiguing journey made him very sadly ill. It was just here by the river that he could go no step farther, But fell down, and there remained. Oh! a heartless man was with him! And the child in that condition by the roadside simply lying Was abandoned by the merchant who went off to the north-east. Then the people of the district nursed and tenderly did treat him (Though I fancy it was really just the Karma of his past), Something in his childish features and his little ways they noted, As if he were of importance, so they watched him carefully. Worse and worse, however, fared he, till the end seemed just approaching, Then they asked him—“Who now art thou? and from whence hast thou just come?” And his father’s surname asked I, and the province of his birthplace: “In the capital my home is, and at Kitajirikawa.” So he answered; “And my father, who is dead, was Yoshida. I, his one child, had been living with my loving mother only, But was kidnapped, and was taken far away, and hence my illness. Truly, often am I thinking of the people in the city, Of their hands and feet and shadows, even, often fondly thinking. As beside the road I’m dying, deign just here to bury me. And to mark the spot I pray thee, be so kind, and plant a willow.” Feebly spoke he, and repeated four or five times a calm prayer, Then it ended. A sad story, is it not, that I have told you? As I see now, in this boat, there are some people from the city, Unintentioned though it may be, you will honourably join us And your lamentation offer with our prayers on this occasion? What! The shore! With this long story we have quickly come to land. For you it is unimportant. Now, I pray you, disembark. Truly, here to-day I’ll linger, and a prayer with you will say. How now! Why does that mad woman not come here from out the boat? Come, at once! Come up, I beg you! Yet how tender-hearted is she! Having simply heard the story she is truly shedding tears. Yet at once, I really beg you, you must come out of the boat. Pray, O Boatman, of that story, what, I beg you, is the date? ’Twas last year, and in the third month; and, moreover, this same day. And that child, what age? And his father’s surname know you? And since then, the parents, have they never sent to make inquiries? No, no relatives inquiring ever came. It is strange beyond believing, but ’tis true—I answer No! Alas! Nor kith nor kin. It is too true! His parents even did not come to you. It must be. Yet, O Heavens, how sad! That child Is him I seek. I, whom you now called wild. O Heavens. O mercy. It must be a dream! Oh, unutterable sorrow. Until now it lay outside me; It was other people’s business. Now you say it was thy child? Pitiful! But wherefore grievest? He is now beyond recall. Come this way and I will show thee where his grave lies. Now ’tis near. This the tomb of him who left us. Offer now thy deep-felt prayers. E’en though I feared it might be so, till now Hope led me on to make this journey long To distant, unfamiliar Azuma; But at the end of the sad way I find Naught in this world but mark of where he lies. Ah! Cruel is it!—If his fate was death— That he should leave his birthplace and have come To a road corner in strange Azuma, And mingled with the roadside earth to lie Beneath a tangled mass of spring-time’s weeds, Beneath this very ground so it doth seem. Then shown unto the mother in earth’s form, May there appear the dear one of her world. The one is taken who might be of use! The one is taken who might be of use! The one whose work is over does remain, The mother, like a withered broom tree left, In whose mind comes and goes his likeness dear, As things are wont in this uncertain world. To man at any moment may come grief, Like heartless storm that shatters blooming boughs The voice of such a storm has called up clouds That fly unsettled and have hid the moon That else had lit the long night of her life. Yea, verily how fleeting must the world Appear to her before us now. Alas! Yea, verily how fleeting must the world Appear to her before us now. Alas! Now, however much thou grievest, ’tis of no avail whatever; Join then with us in the prayer for his good in future worlds. The moon has risen, and the river breeze Blows cool. ’Tis late already, and the gong Tolls out, and we should be upon our knees. But still the mother in her agony No prayer can voice, but only weeping lie Upon the ground that hides her darling joy. Yea! ’tis sorrowful, though others have assembled in large numbers, It is thy prayer that his spirit surely would rejoice to hear. I place the gong now in the mother’s hand. True, ’tis for my child’s sake, as I am told, And in my own hands now the gong I hold. As grief is checked and voices cleared for prayer. In unison we pray this moonlit night. Our thoughts united, to the West we turn. Thee I adore, Eternal Buddha great, Who still the same, for six-and-thirty times A million million worlds of Paradise, For ever in the west dost permeate. Thee I adore, Eternal Buddha great. Thee I adore, Eternal Buddha great. I adore thee, O Eternal Buddha. I adore thee, O Eternal Buddha. I adore thee, O Eternal Buddha. And to my prayer the river Sumida Adds its loud voice the breeze. If true thy name, Bird of the City Royal, Add too thy voice, for this the city’s child. Oh, that was my child’s voice praying, he that said the prayer just now. His voice was it, I am certain, and within this mound it seemed. As you say, we also heard it. And we now will cease our praying, Thou his mother art, and solely, honourably deign to pray. Even if nothing but his voice return, I would that I could hear that voice again. I adore thee, O Eternal Buddha. I adore thee, O Eternal Buddha. The voice is heard, and like a shadow too Within, can one a little form discern. Ah! Mother! Is it you? The mutual clasp of hand in hand exchanged, Once more he vanished as he first had come, But in her thought increasingly the form Of his reflection did repeat itself As in a polished mirror, to and fro. While gazing at the vision came the dawn And dimly flushed the sky, till naught was left. While what appeared to be the child is now A mound grown thickly o’er with tangled weeds, It has become naught but a rushy marsh, A mark of what was once so very dear. Ah, pitiful indeed is this our life Ah, pitiful indeed is this our life! There is no English book entirely on the Nō, but the following Works contain chapters on, and translations of, some of them. Aston, W. G. “A History of Japanese Literature.” Heinemann, London, 1899. See pp. 199-213. 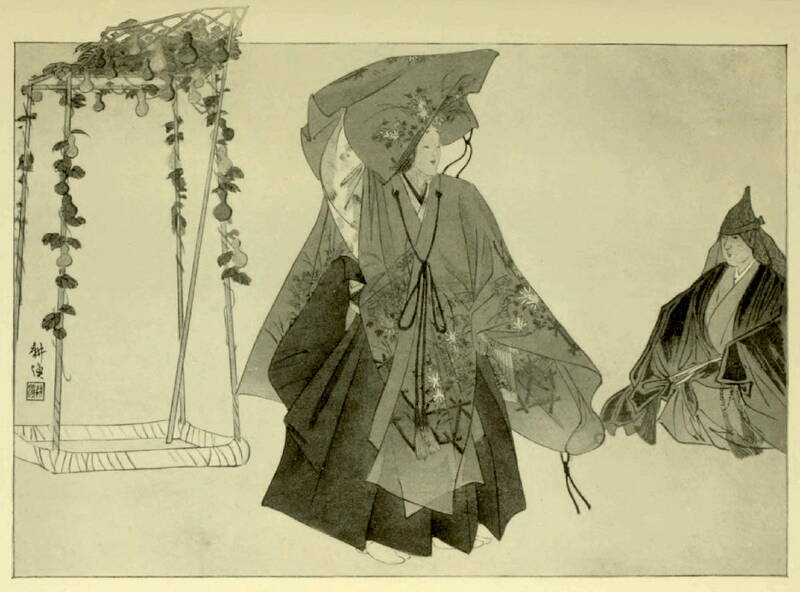 Brinkley, F. “Japan: its History, Arts and Literature,” vol. iii. Jack, London, 1903. See pp. 28-48. Chamberlain, B. H. “The Classical Poetry of the Japanese.” Boston, 1880. See pp. 137-185. Reprinted with additions and deletions as “Japanese Poetry.” London, 1911. See pp. 109-144. Dickins, F. V. “Primitive and Mediæval Japanese Texts translated into English.” Clarendon Press, Oxford, 1906. See pp. 391-412. Also volume of romanized texts of the same. Edwards, O. “Japanese Plays and Playfellows.” London, 1901. See pp. 39-61. Sansom, G. B. “Translations from Lyrical Drama: ‘Nō.’” Trans. Asiatic Soc. Japan, 1911, vol. xxxviii, part 3, pp. 125-176. Stopes, M. C. “A Japanese Mediæval Drama.” Trans. Royal Soc. Literature, London, 1909, vol. xxix, part 3, pp. 153-178. The Sumida River formed the subject of a paper read before the Royal Society of Literature. The translators acknowledge with gratitude the kindness of the Council in allowing them to republish the major part of the verse in the form in which it appeared in the Transactions of the Royal Society of Literature in 1909. Trans. Roy. Soc. Literature, London, vol. 29, pp. 156-7. Trans. Asiatic Soc. Japan, vol. 35, pt. 4. 1908. Primitive and Mediæval Japanese Texts, p. 399. History of Japanese Literature, p. 207. The land and sea breezes, which blow regularly only in fine weather. Trans. Asiatic Soc. Japan, vol. 38, pt. 3, p. 174. Page 39—This piece in the current original is called Motome-zuka, which means, the “Sought Tomb.” In older versions it was previously called Otome-zuka, meaning the “Maiden’s Tomb,” by which name the story was also known in the Yamato Monogatari (“Tales of Japan”), written nearly a thousand years ago. Otome and motome sounding so similar in Japanese, and, as the two men came seeking the tomb, the name was changed in the text of the Japanese Nō, but as the older name both has priority and is more euphonious I revert to the older title. This piece is one of the eleven most important utais, and the Shite’s part is a particularly difficult one to chant. Page 40—The original reads:—Ikuta on Ono no asakazeni nao saekaeru tamoto kana. Here the meaning is very confused, the word for sleeves (tamoto) following in the Japanese mind from kaeru (which means to turn) in saekaeru (it is cold). Page 40—This brings a picture to mind of the contrast between city and country life. An old institution among the well-to-do people of the capital is to make a pleasure picnic for the gathering of the young green shoots in very early spring. It was a general custom to eat the “seven greens” on the seventh day of January each year, and the poor people in the country hamlets make it one of their slender sources of revenue, to gather these green shoots early in January, for the city market. Page 41—Ikuta, the name of the hamlet, has the same sound, though it is written differently, as the Chinese character for numerous. Page 42—The Chinese character for the name Ono reads “little field”; then there is the suggestion that there is little in the way of green sprouts yet. Page 42—The word “prize” is left out in the original out of politeness. The three parts of this song are chanted in different tones. Page 43—Quotation from an old poem. The stanza speaks of the attractiveness of village maidens gathering young leaves. Page 43—Quotation from an old poem. The owner of the field is hoping that the time will soon come for plucking the shoots. He is impatient, and sends the watchman to see if it is not yet time. This idea leads up to “Likewise dost haste” in one of the following lines. Page 43—A part of another old stanza. Page 44—Still another quotation from an old poem, introduced for the word furu. “To fall” and “old” are both furu in Japanese, and “older leaves” in one of the following lines is furu ha. Page 44—i. e. Purple. As is common in Japanese poetry, the word purple is not actually used, but is called “the related colour.” As a colour the Japanese word Murasaki is purple, and it is also applied to a herb with deep purple-coloured flowers. This plant’s colour is so intensely purple that all the herbs growing near it are supposed to show the same colour. From such an idea purple colour is known in poetry as Yukari no iro (the related colour). In the present lines part of an old stanza is introduced for the sake of recalling the word murasaki, and this in turn leads on to yukari no na in the first line of the Chorus. Page 45—The Shepherd’s Purse is one of the seven herbs. Chōan is in China, and the old name of China was Kara, so that the mention of Chōan brings Kara to mind, which in turn suggests the word karai, hot, used in the next line. Page 45—The dawn is sometimes called the “whitening” in Japanese. Note the change of person, of course she has really been speaking of herself from the beginning. Page 47—Ikuta means the living field, or field of life, and as she is about to die the name is meaningless to her. Page 47—Depending on an old poem in which the short growth of the summer horns is used to express the idea of brief time. An alternative translation of this line would be, “Short is my night’s sleep, short are a stag’s horns,” but these words do not convey to an English reader anything like the meaning the Japanese carries. In the original the word tsuka means either a “tomb” or a “grasp,” and it acts as a pivot word. In the sense of “tomb” it leads to the weeds growing on her tomb, which is the essential part; and in the sense of “grasp” it suggests shortness, and inasmuch as a stag’s horns are so short in summer as to be within the grasp of a hand, their shortness is suggested, and this in turn suggests a night’s sleep in summer. This train of thought would probably not occur had it not been rendered a classical picture by an old and well-known stanza. Page 48—He is using the words of the Buddhist scriptures. Though in popular belief the hells and torments, as well as the world, exist, yet the higher philosophy of Buddhism holds that all is appearance only, and that the soul that realises this frees itself from the sufferings and restrictions of the grosser existence. Page 52—Popular Buddhistic teaching postulates eight hells, (1) The hell of equality, where all sinners go first. (2) The hell of black rope, where they are tied and led by devil-jailors to (3) the hell of gathering. Then comes (4) the hell of cries, (5) of bitter cries, (6) the hell of heat, (7) of utmost heat, and lastly (8) the hell of infinite depth. Page 53—Kagekiyo’s full name is Aku-Shichibioe Kagekiyo. Aku—literally means “wicked”; but sometimes has a special meaning of “wild” or “boisterous,” as in the present case, where it intimates that the man is rough in manners and strong in arms. Page 56—In the original it reads, “Kamegaegayatsu in Kamakura”; but as this will not fit into any possible metre the first word is left out. Page 56—Taira becomes Hei when compounded with a following character; thus Taira House is Hei-Ke. Similarly “Minamoto” becomes Gen, thus Gen-ji is the Minamoto family. Page 57—Tōtōmi, the name of one of the provinces through which they came, means “distant bay.” Also to or tou with a different ideagraph means “to ask.” Mikana, the name of another province through which they passed, means “three rivers,” which leads to the idea of bridges. But more than that, Mikana is noted for its eight bridges, spanning over the streams which branch off like the legs of a spider, which is kumo in Japanese; and this idea leads on to that of “clouds,” which are pronounced kumo, though written with a different ideagraph. The idea of “clouds” leads on, finally, to that of the “capital,” where only those of high rank “above the clouds” are dwelling. Page 59—Kagekiyo takes up Hitomaru’s words, originally used in a simple, physical sense, and applies them to the spiritual world. It is, nevertheless, not supposed to be a dialogue; each is soliloquising. Page 60—And therefore could play no part in his warlike schemes. Page 65—Meaning that if she had been a boy he would have welcomed her; but now he takes no account of her hardships and difficulties in reaching him. The words used give a suggestion of dew-like. Page 65—Proclaiming herself the child of an exile and beggar, to her social detriment. Page 66—The word sumu, “to live,” also signifies “clear,” which is associated in poetry with the moon, which in its turn leads to the thought of shadow, Kage leading to Kagekiyo. Page 66—A mythical animal, of which the nearest translation is perhaps the unicorn. There is a proverb which states that though it is the king of beasts, when old it is worse than a useless horse. Page 67—That is in the year 1185. Page 67—Yoshitsune’s complete name was Kurō Hang wan Yoshitsune. One of these, or all three names may be applied to him. As the three names make an impossible encumbrance for a line I only give him one, even where the Japanese original calls him by his full name. Page 68—The jointed cape of his opponent’s armour. Page 68—The Minamoto clan were victorious, and when in power they banished Kagekiyo as a specially dangerous enemy. The Chorus here speaks for Kagekiyo to Hitomaru. Or Kwannon, the Goddess of Mercy, one of the principal deities in the popular religion of Japan to-day. The reign of Emperor Heize = 806-809 A.D. Page 78—Azuma is a name for the east of Japan, really the region surrounding Tokio (literally the eastern capital). The old capital in the west, Kioto. Page 80—This is a particularly difficult passage. I had previously rendered the lines more freely than the rest of the translation, in an endeavour to construct a consecutive verse which might keep the attention of an English reader. In its present form the verse is perhaps nearer the original, but no entirely literal translation is possible of a passage so full of the essentially Japanese “pillow” and “pivot” words. At the outset the Mother quotes a few words from an old poem. Page 81—Most of these three lines is added for the sake of rounding off the thought in English. Page 81—This is not the large commercial town of the same name. Page 82—Reference to an old Chinese fable of a bird who had four young, and was bitterly distressed when the time came for them to fly away. Page 82—Sumi means the corner, or end of everything. Page 83—Local ferries sometimes hindered strangers from the city, but she intimates that the Sumida is a river of too great importance to expect such treatment on it. Page 83—Narihira is one of the well-known early poets of Japan, he died in 880. Chamberlain, in his Classical Poetry of the Japanese, quotes an opinion of Tsurayuki (who died in 946) on Narihira. He says: “Narihira’s stanzas are so pregnant with meaning that the words suffice not to express it. He is like a closed flower that hath lost its colour, but whose fragrance yet remaineth.” Narihira is noted among the classical poets for his conciseness and frequent obscurity. Page 84—She is vexed with him for not entering into the spirit of the place and realising the quotation she has just given. Page 84—These lines depend on pivot words, which by playing upon the root words in the Japanese, connect the ideas prettily. Page 87—And therefore it appeared to them hopeless to expect him to recover from the illness. Page 88—The shadows of people are much more real in Japan than here. The shadow pictures that are continually thrown on the white paper screens separating the rooms must fill a large place in the memory of one who has lived in Japan; and, too, it is often only the feet of a passing noiseless maiden that one can see through the openwork base of these screens while one lies on the quilts on the matted floors. Page 91—This arises as a play on the words Hawa, a mother, and hawaki, a broom tree, and also refers to a legend about a broom tree which appeared and disappeared. Page 92—Time, therefore, for midnight prayer. Page 92—The gong in the Buddhist shrines is struck by the one who prays. Page 92—The West is the direction of the Buddhist heavens. Page 93—The words are from the Buddhist scriptures, according to which there are thirty-six million million worlds, all presided over by emanations of the same Buddha. The voice of the Child’s Spirit is heard accompanied by the Chorus’s chant.